There is something about this time of year I love, and no it is not all the hustle and bustle at work or trying to get everything completed before the holidays. It’s actually a bowl of soup. Yep, pretty dang simple over here. I will have to admit however that my appetite or at least the ‘crave’ component is not what it was in the past. I blame cancer for that, but it is what it is. When I do get that urge though, I could not be more happy than with a bowl of soup. 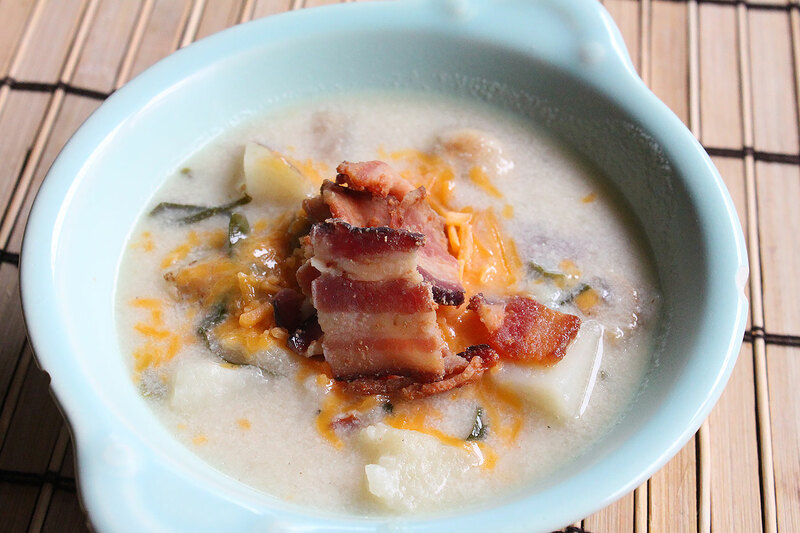 This is one of those recipes, the loaded steakhouse potato soup. Why steakhouse? When I think steak house, or supper club for those of us in Wisconsin, I think of not only a great steak, but that baked potato, those mushrooms, bacon wrapped whatever, and so I decided to make this style of soup for my daughter, only because she loves mushrooms and I wanted to bring that meatiness to the soup without the meat. Well, there’s bacon, but c’mon…. This has everything I love about a visit to a supper club, plus a great use of kale from my last harvest. Now the only two choices you have at this time is do I leave the skin on, or remove the skin from the potatoes or do I boil or roast them? I’ll leave that to you. Me, I’m skin on and boil. The rest of the family is skin off. I’m out numbered so I leave one with the skin on. 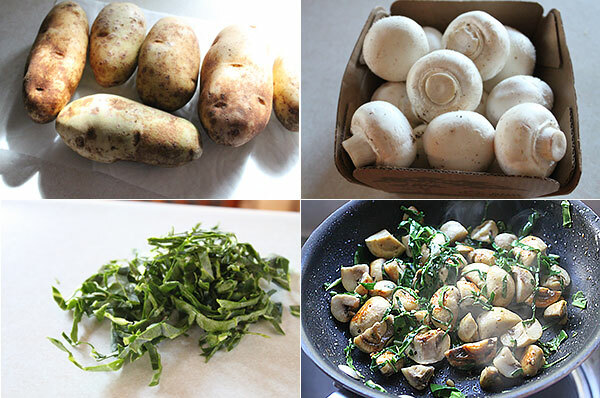 Start by adding the potatoes to large pot filled with cold water. Bring to a boil, reduce the heat, and cook just until slightly tender, about 12-18 minutes. Once cooked, strain, cool, then cut into bite sized pieces. The potato will break down a bit to thicken the soup when you are ready to rock and roll. During this time, cook the bacon. If you know me, I’m a fan of Nueske’s. Best stuff out there in my opinion. Once cooked, reserve the bacon fat, but remove the bacon and coarsely chop it. If that was not enough for you, get another pan on the stove on medium heat, add a bit of that bacon fat, then toss in the mushrooms, season with salt and pepper, and get them nice and caramelized. There’s something about caramelized mushrooms if you know what I’m saying. Once those begin to caramelize, toss in the garlic, and kale. Give that a good toss, and remove from the heat. Get your stock or soup pot on the stove on medium heat. Add all that bacon fat, then stir in the flour. Cook the flour and continue to stir for about 3-5 minutes, if that. You just want to cook the rawness from that flour. Pour in the milk, continue to stir so that you break up the clumps of flour. This is your base for the soup. This will take about 10-12 minutes or so. You will see it get to a thickening state. If you want it thinner, add a bit of stock (optional). Now add in your potatoes, and stir. Next add in the mushroom and kale mixture and give another good stir. Reduce to a simmer. Now you are ready to serve. Ladle the soup into your bowls. garnish with cheese and bacon and dig in! This soup screams everything. Actually everyone who ate it was quiet (which is always a good thing)! You get everything comforting from the creaminess and the potato, then the crisp bacon pieces and awesome cheese note. Then what? KALE? Heck yeah, kale brings this over the top, and makes your feel good about yourself after that bowl (or two) of soup. It’s a winning soup. It is the Loaded Steakhouse Potato Soup. Stay warm my friends.